To Authentique, beyond the antique cultural value behind the symbols of Mai Lan Cuc Truc (Mai blossoms, Orchid, Chrysanthemum and Bamboo) found in the virtues of maintaining an air of nobility as well as honour and integrity in difficult circumstances, these four flowers are a quiet reminder of the gentle passage of time and of life. Summer transitions into Autumn, Winter melts and Spring arrives. In this such immutable cycle of life, despite all the seemingly relentless changes, it is through them that universal love and human beings can sprout and bloom. This Tet season, Authentique is proud to bring to you our Mai Lan Cuc Truc collection through the touching brushstrokes full of care and emotion of the talented craftsmen at Cam Ha pottery, and behind every meticulous line of embroidery at the Cam Giang textile workshop. The collections are a heartfelt and loyal tribute to our dear customers who are close at heart to Authentique’s philosophy for these many years, and are a bow of thanks to nature, our greatest teacher. 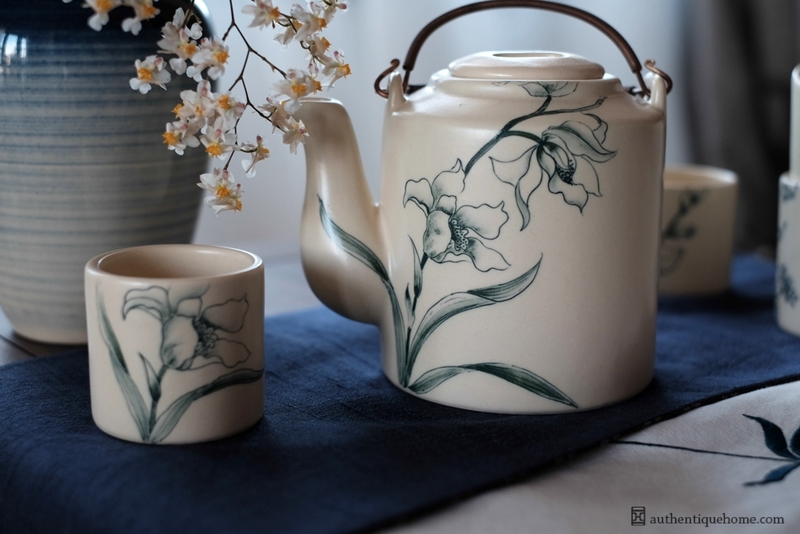 Authentique hopes that for these early spring days, you will spend more time with your loved ones, have a cup of tea with one another, watch the branches and remember that time is passing through the flowers. And because of that, we will love each other fuller and more completely.